Saint Anthony Gift Shop offers a broad range of religious and spiritual items including Bibles, devotionals, prayer cards, rosaries, statues, keepsakes, home décor items and more. 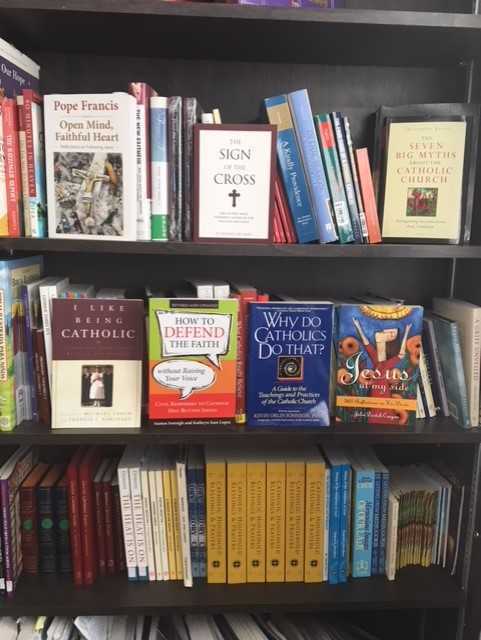 Located on the campus of Saint Anthony Catholic Church and School our store is the one of the few available shopping outlets for quality Christian items in Lakeland, Florida. We have gift items for all occasions for example, Baptism, First Communion, Confirmation, Marriage, Holy Orders. We also carry a selection of children&apos;s and adult prayer and devotional items, as well as some Saint Anthony Catholic Church mementos. Browse the pictures below to get an idea of the type of items we sell. If you have something special in mind, come in and see us - if we don&apos;t have it, we can special order it for you! If you would like to spend some time supporting the Gift Shop with your time and talents, we would be most happy to have you on board. Each time the store is open, we need a minimum of two volunteers. With more hands on deck, we would aim to open the store more frequently. Duties involved are those associated with any retail outlet, for example: merchandise display, tidying and organizing the store, customer service, working at the register, assisting customers in finding a special item. All volunteers at Saint Anthony Gift Shop are required to pass Orlando Diocese Background Check and Safe Environment Training. Full local training would also be provided. Select Inquiry REQUIRED (Select One) Inquiry about Special Order General Gift Shop Inquiry Sign Up to Help Please fill out this field.